Last year we had the Golden Billys. 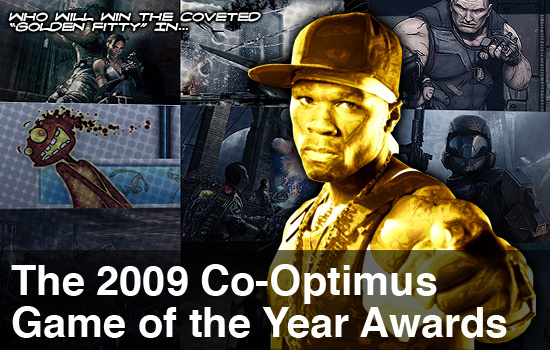 This year our boy 50 Cent lends a golden hand, and diamond skull, to our co-op awards. We have seven categories of winners to announce and just like 50 Cent, it's all serious business. 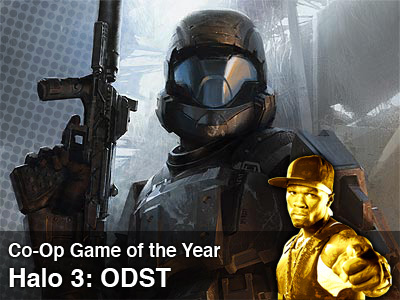 So hit that ramp and jump right into the 2009 Co-Op Game of the Year Awards. When it came down to it, no other game provided more cooperative options in terms of split screen, online, difficulties and extra modes than Halo 3: ODST. Firefight came out of nowhere as an addictive bonus co-op mode and provided many of us hours and hours of play. Was ODST ground breaking? Probably not. But it was fun and furthermore, it was more fun with friends. It was a tough battle for sure, and in fact, we almost chose Dawn of War 2 as the GOTY, but the game's limited save capabilities for co-op knocked it down. Our community went with Borderlands, another admirable choice. No doubt we have members that literally have dozens of characters and hundreds of hours logged into the game in co-op. With a ton of DLC support on the way, there's no doubt Borderlands will be played well into 2010. Additional co-op modes are all the rage, and while Gears of War 2 set the trend with Horde mode last year - this year another Microsoft published title raised the bar. Halo 3: ODST's Firefight mode became strangely addictive. In fact most of us could hardly believe we had just played a single match of it for three hours. Enjoyed split screen, online, or a combination of the two - Firefight is a worthy addition to the ever growing list of Survival modes - one we hope other upcoming games take note of. Our community agreed. Earlier this year Mercenaries in Resident Evil 5 stole our hearts as it provided a quicker style of survival gameplay. Instead of three hour marathon session, you'd be lucky to survive a full 5 minutes. Page created in 0.6040 seconds.